Having kids can change a person’s life drastically as babies require extra attention and care all the time. Part of the significant lifestyle change that one has to undergo is having to bring plenty of stuff when going out with the little ones. Contrary to popular belief, having kids does not mean giving up one’s fashion sense. This is why plenty of manufacturers have given so much attention to producing diaper bags that are both stylish and functional. If you are on the lookout for this kind of diaper bag, then why not give Isoki Madame Polly Baby Diaper Bag a try? What to Look For In A Diaper Bag? There are many diaper bags on the market these days. They come in different styles, designs, prints, and features. The great number of choices can sometimes make a buyer feel overwhelmed. Hence, it also becomes beneficial to know what to look for in a diaper bag. Diaper bags can come in the form of a backpack or a shoulder bag. Before heading out to buy one, make sure to choose which style will suit your needs. The number of pockets or partitions is also a crucial factor in deciding which particular diaper bag to purchase. The number of pockets varies from one product to another. Some would have more external pockets, and others would have more interior ones. Some pockets would be open; others would be zipped. Know beforehand whether you would prefer more pockets on the outside for easy reach or if you would like more divisions and partitions within the bag. One of the most common features of diaper bags is the provision for baby bottles. This is important as having a place that fits the feeding bottle well is essential. After all, nobody wants to look for the feeding bottle in a big bag especially when the little one is already screaming for milk. Plus, one might consider whether they would prefer to have insulated bottle pockets or not. Having insulated pockets is a great help as they can help keep the bottle warm for hours. Additional straps are another point of consideration. After all, many parents would prefer to hang their diaper bags on the stroller for convenience purposes. Some products come with adjustable straps for strollers while others don’t. It is highly recommended to look for a bag that comes with this add-on as it would make the life of the user much more convenient. The Isoki Madame Polly Baby Diaper Bag promises to let parents look fashionable while carrying their babies’ stuff around. It is made from man-made vegan leather that is easy to clean as one only needs to wipe the bag to remove the dirt. This diaper bag measures 16.9 by 7.1 by 12.6 inches. This diaper bag is spacious and comes with three big compartments to ensure that parents can easily place, organize and find their valuables as well as the baby’s essential items. The bag is fully lined and has premium stitching and zippers. This fashionable diaper bag comes with a lined zipper purse, an insulated bottle holder, full-size padded changing mat, and removable stroller clips. It also has a detachable shoulder strap measuring 26.78 inches when folded and 52.76 when unfolded. The Isoki Madame Polly Baby Diaper Bag promises a stylish approach to carrying the babies’ things around while providing convenience. The bag is made from man-made vegan leather that is easy to clean as one only needs to wipe the product. The bag is fully lined as well. Organizing items inside the bag are quick and easy, too as it has three large compartments. It also has a detachable shoulder strap as well as removable stroller clips so parents can hang their bags on the stroller. This diaper bag also comes with other add-ons namely, a lined zipper purse, an insulated bottle holder, and a full-size padded changing mat. This diaper bag, however, has one major flaw as the detachable strap breaks easily after weeks of use. The Isoki Madame Polly Baby Diaper Bag is not entirely a unique product as other manufacturers have produced almost the same item. For example, the Babymel Grace Vegan Leather Tote Diaper Bag shares many of its same virtues. For one, the Babymel Grace Vegan Leather Tote Diaper Bag is also made from vegan leather that is easy to clean as one only needs to wipe the bag to remove dirt. It also has a detachable shoulder strap with integrated stroller straps to allow users to hang the bag on the stroller. The diaper bag from Babymel also has compartments inside for organizing items conveniently. It also comes with a padded changing mat that is machine washable. However, there is one big difference between the two bags. 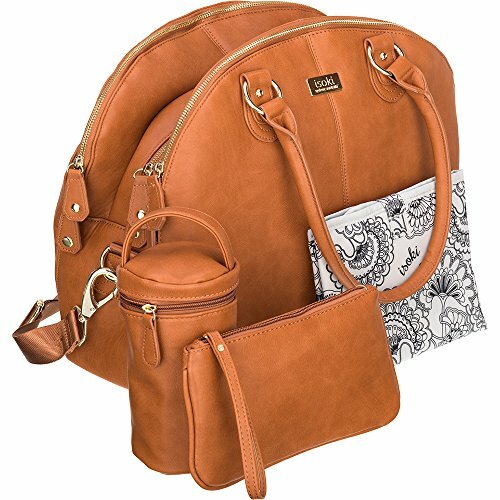 Babymel Grace Vegan Leather Tote Diaper Bag has a built-in side bottle compartment that is insulated whereas the Isoki Madame Polly Baby Diaper Bag has a separately insulated bottle holder. The Isoki Madame Polly Baby Diaper Bag is a product that combines style and function. This product allows parents to organize the baby’s essentials without much fuss or hassle with its three spacious compartments. Plus, made from man-made Vegan leather, cleaning this diaper bag is also easy as users only need to wipe it clean. This product maker has also provided many other items with the bag such as a lined zipper purse, an insulated bottle holder, and a full-size padded changing mat. It has, however, one minor drawback as the detachable strap is not that durable and breaks quickly from frequent use. This diaper bag is highly comparable to other similar products on the market, too. No single feature makes it stand out from the rest, nor is there a major shortcoming that should keep buyers from getting the product. In the end, this stylish and functional diaper bag is worth buying.